Bentley has revealed the all-new Continental GT, ahead of its public premiere at the 2017 Frankfurt Motor Show. Prices will start at around £157,000 and deliveries will begin in March 2018. Under the bonnet is an improved version of the same W12 engine used in the previous car, paired to a new eight-speed dual clutch transmission. Peak power is 635PS and peak torque a huge 900Nm. Performance is strong to say the least - 0-62mph takes 3.7 seconds, while top speed is 207mph. Emissions - as if they matter in a car like this - are 278g/km while economy is 23.5mpg. A V8 version will follow shortly after launch. The chassis uses a new adaptive 'Dynamic Ride' system to automatically adjust to the road, actively controlling body roll to provide precise handling, while still delivering very comfortable ride quality. Wheels are 21-inch as standard, with 22-inch options. 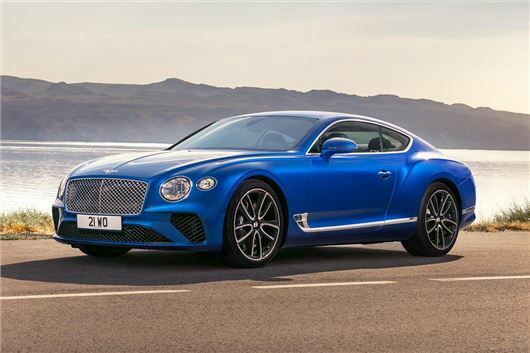 As before, the Continental GT is a two-door car with four seats – but rear seat space has been improved over the previous model, as has luggage space, which Bentley says gives the car "genuine real-world usability". Inside, the Continental GT is as beautifully made as ever, with traditional handcrafted materials and the usual wealth of customisation options. One of the highlights is a rotating section in the dashboard - so the 12.3-inch touchscreen can be hidden away when not needed and replaced with simple veneer or an analogue clock. The standard 10-speaker, 650w audio system can be replaced with a 1500w Bang and Olufson 16-speaker system or, if you’re feeling extra flush, a 2200w 18-speaker Naim system. Other options include 15 different types of carpet, 15 different choices of hide upholstery and more than 70 colours – plus bespoke options. You can also specify handy technology, with traffic jam assist, adaptive cruise control, active lane assist, a head-up display and even a night vision camera on the huge options list.